Check the DVD chart 2015 to discover top DVDs 2015 available (incl. recent DVD releases) so far and learn how to rip/copy DVD. Fast rip/copy top DVDs 2015 (incl. copy protected DVD) to MP4, AVI, WMV, MOV, iPhone 6S/6, iPad Pro, etc. with ease. To help you stay informed on the latest DVDs releases & planned DVD release dates, here we list top 36 DVD releases 2015 for you according to the DVD release dates. DVD discs are always fragile and can be easily scratched or damaged. In order not to bother inserting rented/bought DVD disc to the DVD drive each time, you may want to get digital copies of favorite best DVDs of 2015, which is also the best way to watch full movies. WinX DVD Ripper Platinum can help you achieve the task without hassle. It is a reliable fastest DVD ripper enabling you to rip any DVD movie in the DVD chart 2015 to MP4, AVI, WMV, MOV, H.264, FLV, iPhone 6S/6, iPad Pro/Air, Apple TV, Android Samsung, HTC, etc. in about 10 minutes with highest quality thanks to its multi-core CPU (utmost 8), Hyper-threading tech and High Quality Engine. Besides, it is also a DVD copy program providing you 4 DVD backup modes to easily copy DVD to hard drive, including 1:1 copy DVD to ISO/Folder, copy DVD main title/full title to a single MPEG2 file with original videos/audios/subtitles in 5 minutes. Last but most important, this fastest DVD ripper can rip any protected DVD without any third-party DVD decrypting software because it can bypass all DVD copy and region protections incl. DVD CSS, region code, RCE, Sony ArccOS, UOPs, Disney X-project DRM and constantly updates to support latest new protected DVDs. Before getting started, free download and install WinX DVD Ripper Platinum on your PC or Mac (free download Mac version), and follow the 3 simple steps below to rip any favorite DVD in the DVD chart 2015 to almost any formats/devices. Here take ripping Inside Out DVD as example. Step 1. Launch WinX DVD Ripper Platinum. Insert the Inside Out DVD into your DVD-ROM, then click the "DVD Disc" button at the top-left. 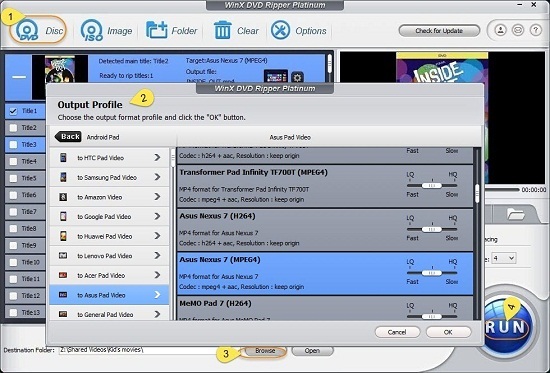 The DVD ripper can auto check the main DVD movie title for you and it can rip DVD with 99 titles. Step 2. Select output profile under the different categories. 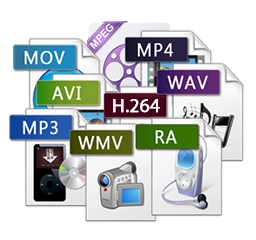 You can choose to rip DVD to MP4, AVI, WMV, MOV, FLV, iPhone, iPad, Android and many more according to your own needs. Step 3. Click "Browse" button to choose a destination folder to store the ripped Inside Out movie. Hit "RUN" to start the process of ripping Inside Out DVD as well as any other movie in the DVD chart 2015. Notice: This DVD ripper only advocates ripping top DVDs 2015 for personal use and suggests referring to the DVD copyright laws in your countries before doing so. 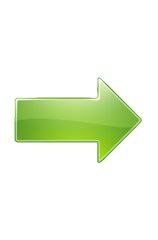 Download the best fastest DVD ripper to help you rip any DVD (incl. copy-protected) to MP4, AVI, WMV, MOV, iPhone 6S/6 Plus, iPad Pro/Air, Android, etc. and copy recently released DVDs to ISO image/DVD folder/MPEG2 file with ease.